Members of the Southeastern MA Amateur Radio Association were saddened to learn that club member Bill Miller, K1IBR passed away in the early morning on February 5, 2007 following a brief illness. Funeral arrangements are private. Miller was a driving force in SEMARA for decades; in addition to his “Elmering” efforts benefiting many in his club, K1IBR also made substantial contributions to Eastern MA section activities. 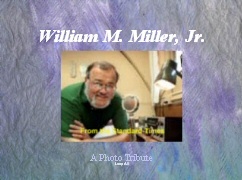 The club has established a tribute page to Bill Miller on its web site at http://www.semara.org/k1ibr.html.